Queensland’s Gary Phillips set a new track record en route to number one qualifying position in Top Alcohol on day one of the ANDRA Drag Racing Series at Darwin’s Hidden Valley Drag Strip. Phillips’ pass of 5.650 eclipsed the previous track record of 5.685 that was held by Darwin local Scott Maclean. With 11 cars battling to make it into an eight car race day field, Phillips said he was just glad that he was in the show for Saturday with his Lucas Oils Funny Car. “As long as we weren’t in those ninth, tenth or eleventh spots I didn’t care,” he said. “We elected to roll the dice and sit out the final session and the time managed to stay number one. With the ANDRA Top Alcohol championship possibly within his grasp this weekend, Phillips said he will be keeping one eye on how other results go when racing begins at 6pm on Saturday. The new track record was a credit to the Hidden Valley redevelopment done in 2011 with the super-smooth racing surface allowing teams to put down quick runs in the tropical humidity. In fact, three teams ran under the existing track record. “The work put into this venue really showed tonight with how quickly everyone was running,” Phillips said. Meanwhile in the Top bike division, Greg Durack earned his first ever top qualifying honours, with a 6.953 taking the number one spot. Durack’s turbocharged Kawasaki proved one of the most consistent motorcycles of the night and he too was full of praise for the Hidden Valley facility. “The track feels great, it is so flat and smooth and the bike tracks in a nice straight line,” he said. “It’s always good to come this far and get top qualifier. It’s a great effort from the team and especially in this kind of tropical atmosphere, getting into the sixes was pretty reasonable. Sportsman racing kicks off from 5pm Saturday, with the first round of Top Alcohol and Top Bike from 6pm. Steven Ham took his second career win as Gary Phillips wrapped up his 17th ANDRA championship title on a pivotal night of the ANDRA Drag Racing Series at Hidden Valley Drag Strip in Darwin. Ham’s 5.645 second pass in the final defeated a close but losing 5.732 from John Cannuli and in the process moved to second in the championship, albeit out of reach of Phillips’ points lead. The win did not come without its share of drama for Ham, with the team enduring a run of gremlins interfering with the 3500 horsepower East Coast Lubes Funny Car. “A lot of hard work went into it just to get us to the last round here tonight,” he said. “We had no working data logger, no tachometer, oil pressure problems, it was just drama central and we had to put it all out of our minds and just go for it. Ham explained the tropical conditions meant the team needed to ramp up the power in order to keep up with the excellent Hidden Valley track surface. “We’ve had to really step on the motor a lot to make the power we need to get down the track; it wasn’t making that much power in this humid air,” he said. Phillips meanwhile enjoyed the opportunity to celebrate his 17th ANDRA title. It was his 16th in Top Alcohol, adding to his single Top Doorslammer championship. “We’re over the moon to win, every season is still a challenge and that is why we keep coming back,” he said. The stories on the track weren’t just limited to Top Alcohol with Western Australian rider Greg Durack earning a win at what became his debut event. Durack expected to race at the Fuchs Winternationals in June and qualified well, but rain meant no racing could be run and he had to put off his dreams until August, where Darwin made up for the Brisbane weather in spades. Durack used a 7.092 pass to defeat points leader Chris Porter who sent sparks flying as he tried to keep his nitro-fuelled Harley in his own lane. Top Alcohol is now left with just one round remaining, the Australian Nationals at Sydney Dragway in November, while Top Bike’s penultimate championship round will be a part of the return of ANDRA Drag Racing Series action to Calder Park in October. 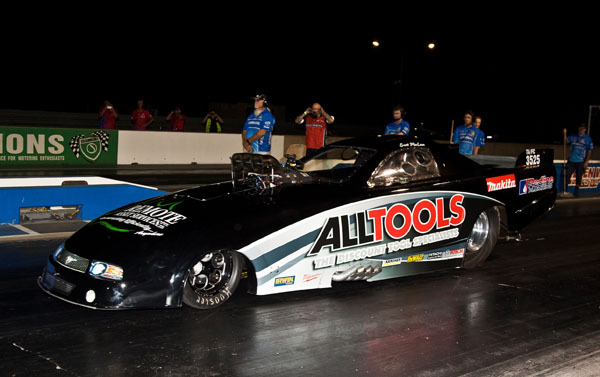 Gary Phillips has a stranglehold on the Top Alcohol championship with just two rounds remaining and this weekend at Hidden Valley Drag Strip could see the Lucas Oils Funny Car driver wrap up his 16th title in the category. Phillips has a 93 point lead over second placed Steve Reed. If he can leave with anything greater than a 118 point lead over his nearest rival then it’s game, set, match for the cagey Queenslander. But Phillips says the last thing on his mind is championship hunting when there is a wildcard track like Darwin to tackle first. “It’s not my game to look that far ahead. We will go up there with an open mind and do the best we can do. But I’d rather be the target than the arrow,” he said. Phillips is one of the few interstate drivers that has some experience on the new Darwin track surface, which was laid as part of a Northern Territory Government-funded upgrade to the venue in 2011. But that was in a Top Doorslammer and Phillips says the Funny Car, almost half a second quicker to cover the quarter mile, is a totally different proposition. Darwin’s Hidden Valley Drag Strip provides completely different conditions to anywhere else in Australia. The track’s location in the northern tropics of the continent mean that humidity becomes a big factor. “The conditions are so unique to that track, the humidity and the temperature up there is not matched anywhere,” Phillips said. “I have seen it up there where it is nearly raining the humidity is so high. Even racing in Townsville cannot compare to it. It’s just about like you’re racing in water, but everyone is in the same boat (so to speak). Phillips will be against the best of Australian drag racing including former national champion Steve Reed, Australia’s quickest active female racer Debbie O’Rourke, Queensland powerhouse Steven Ham, John Cannuli, Gary Busch, Rob Pilkington, Frank Intini, Jay Henning, Mark Probst and Scott Maclean. Joining Top Alcohol will be the nitro-fuelled Top Bikes of Australian championship leader Chris Porter, Terry Burnett, Greg Durack, Dennis Grant and Gordon Crawford. Qualifying begins at 6pm Friday August 16 with eliminations racing from 5pm Saturday August 17. Australia’s quickest current female racer Debbie O’Rourke is hoping her first trip to race at Darwin’s Hidden Valley Drag Strip in the ANDRA Drag Racing Series goes off without a ‘bang’. O’Rourke is one of the most experienced racers in the Top Alcohol category and knows the highs of 400kmh passes down the drag strip as well as the lows when things go wrong. Like most of the other teams attending the historic event, the O’Rourke Motorsport outfit, supported by KTrans WA and 1320 Race Cars, says they will be taking a softer approach to initial runs to get to learn the Hidden Valley track’s intricacies. “From a track point of view obviously it is pretty good with Scott Maclean running those quick times recently,” she said. “The heat will have an effect, but we have raced in Perth before where it gets hot and I have my ice vest so I will be ready. “Getting it down there is the number one priority. We had a bit of an issue at the last event so we’ve taken a more conservative approach for Darwin, put some new gear ratios in it and looked at the fuel system to make sure it doesn’t repeat what it did (backfiring the supercharger). O’Rourke began in the entry level category of Super Street back in the nineties and ever since then has progressed up through the various categories of drag racing including a stint in what was the world’s quickest Holden Torana, capable of reaching 350kmh in under seven seconds. With hundreds of runs down drag strips around the country, incidents like her 3500 horsepower Funny Car backfiring the supercharger at Willowbank Raceway in June are now part of the game, with more concern about being ready for the next round of racing. Such backfires are basically a small explosion on top of the motor and can have some serious concussive force. “It’s happened too often, more than we’d like, and now it’s more about frustration than fear,” she said. “The first time I had a fire, which was a few years ago now, it was ‘oh my god, when do I pull the fire extinguisher’, but now the incidents are more about getting back for the next run. It’s not until you are back in the pits and see some of the damage that it hits you. Drag racing requires teams to be aggressive with their tune ups to get down the track quickly and O’Rourke explained that their approach was just a little too much on the aggressive side as they search for the balance. “We have been running some quick launch times but the motor is getting away from the wheels and it is often getting out of control before I can reel it in,” she said. O’Rourke will be facing the cream of Australian drag racing including reigning national champion Gary Phillips, former national champion Steve Reed, Queensland powerhouse Steven Ham, John Cannuli, Gary Busch, Rob Pilkington, Frank Intini, Jay Henning, Mark Probst and Scott Maclean. Darwin drag racer Scott Maclean may not have the vast experience of more seasoned drivers in the ANDRA Drag Racing Series, but when it comes to his home track of Hidden Valley Drag Strip, Maclean is going to be the man to beat. On Saturday night Maclean beat his own track record again with a run of 5.685 at 251.95mph (405.46kph) over the quarter mile, which plays host to its first ever ANDRA championship rounds of Top Alcohol and Top Bikenext Friday and Saturday, August 16 and 17. In a warning shot to the nine other teams who are travelling to the event, Maclean said there is more to come yet from the AllTools Ford Mustang. Despite its low altitude, Darwin’s Hidden Valley Drag Strip is still located in the very north of Australia and experiences tropical conditions that can rob high performance engines of horsepower. Maclean says he hopes the data the team has accumulated for Darwin’s unique conditions will give them a head start on other teams but doesn’t doubt that the likes of 15 times ANDRA Top Alcohol champion Gary Phillips will quickly come to grips with Hidden Valley. With his family, friends and sponsors all in attendance, it’s going to be a lot of pressure for Maclean but also something he can revel in as he gets to prove himself against the nation’s best racers. Maclean will be facing the cream of Australian drag racing including reigning national champion Gary Phillips, former national champion Steve Reed, Australia’s quickest active female racer Debbie O’Rourke, Queensland powerhouse Steven Ham, John Cannuli, Gary Busch, Rob Pilkington, Frank Intini and Mark Probst. Joining Top Alcohol will be the nitro-fuelled Top Bikes of Australian championship leader Chris Porter, Terry Burnett, Greg Durack and Gordon Crawford. Maclean's AllTools Funny Car will be on display in the Smith Street Mall, Raintree Park, Darwin City on August 15 from 12pm to 3pm, with live crosses from Northern Territory radio station Hot 100. The next ANDRA Drag Racing Series event will be a historic occasion when Top Alcohol and Top Bike race for championship points at Hidden Valley Drag Strip for the first time. The venue went through a $4.6 million upgrade from 2010 to 2011, bringing it to an international standard. The work included a complete resurface of the track as well as the installation of a concrete surface to the 330 feet mark, upgraded safety barriers, a new burnout pad, the installation of Australia’s largest readout (timing) boards and an improved spectator viewing area. The concrete launch area in particular won awards for its flatness which allows high horsepower vehicles to get all their power down without having to worry about any bumps along the way. The work at the Federal and NT Government-funded venue has made it an attractive prospect for national championship events and Hidden Valley Drag Racing Association president Jay Jukes said being able to host an ANDRA Drag Racing Series round was a coup for the top end. “While the venue is a Territory Government asset all drag racing events are still fully club run by a fantastic group of dedicated volunteers and we are lucky to have a very solid member base behind us,” he said. Hidden Valley is unique in Australian motorsport as it features a drag strip running parallel to the circuit allowing the two disciplines to share facilities but also ensure individual needs are met. This will be the second national level event held in the Northern Territory in a matter of months, following on from June's Aeroflow Sportsman Drag Racing Championship at Alice Springs Inland Dragway. Racing Surface Length – Quarter mile (402 metres), shot-peened concrete to 330 feet (100 metres) and bitumen for remainder. Check out the local burnout guys doing some testing on the pad today getting ready for Brasher Nats Darwin 30th April. Do you have a passion for motorsports and have some spare time? Want to be up close to the action? We need more volunteers as many hands make light work. So if you or someone you know are interested in helping out get in touch with us mail@hiddenvalleydrags.com. Have you got your copy of The NT News today? Make sure you get it, to catch up with all action from Adam Murrihy's journey to becoming the Australia Supercharged Outlaw Champion. Check out the crowd at the Australian National Drag Racing Grand Final....I wonder how many from the NT are there? If you know anyone that's there tag them. Photo Thanks to Doogie Howson. Now when we all wished for some good, close drag racing this weekend at the Australian National Drag Racing Association Grand Final at Adelaide International Raceway Drag Racing we didn't mean this kind of close racing. He spends so much time in the top end we can claim him as a local right?? Grant O'Rourke with O'Rourke Motorsport trying to stop Zappia from taking a 9th Title. Do you think he can do it? Hi everyone, Please find the latest Competitor Bulletin from HVDRA below. Photo - What a great opportunity for all the NT Burnout competitors. What a great opportunity for all the NT Burnout competitors. Photo - Exciting times ahead with another world class track commencing works! Exciting times ahead with another world class track commencing works! Never try to save money on your safety equipment. Good morning everyone, Just a reminder about tomorrow night's meeting at Motorpsort House at 6pm. Following on from the 27th of Feb information meeting with ANDRA & IHRA, we need to keep moving forward, so we will complete the questions from that meeting, pass on up to date information and cast a vote. You need to be there! Photo - This event is going to go off in the Top End! This event is going to go off in the Top End! Make sure you tune into Speedweek at 2pm to catch all your drag racing action from Hidden Valley. **ATTENTION ALL DARWIN DRAG RACERS** HVDRA is inviting you to come along to a meeting this Saturday to discuss the future sanctioning body for our club. The decision will effect all racers so we urge you to attend ask questions and provide feedback to the club so we make an informed decision moving forward. PLEASE RSVP your attendance via accepting this event or email mail@hiddenvalleydrags.com Please tag any drag racers who you feel may not yet be aware of this meeting. Video - Have you ever seen a drag race finish like this before? Have you ever seen a drag race finish like this before? The boys are hard at it already this morning scraping the track ready for the new season. What PB are you hoping to run? Wow what a run by Gary Phillips in Perth. Do you think he can get the world record this weekend? Congratulations Gary & Debbie Phillips Racing - first Pro Alcohol Funny Car into the 5.30s! 5.374/267!!! Video - How's this for a walk down memory lane? Can you name some of the cars from back in the day? Help wanted. A working bee was recently undertaken by some DMCC members and others to assist a life member and long term supporter of all NT Motor Sports, Jordy, due to illness. They could do with some more help and would like to do another working bee on Saturday 13 February from 8am and can do Sunday if you can't attend on Saturday. If you can message me, respond to this message. Ph 0412 904 574 or 0417 811 423 for the address and/or more information. Please forward to who may be interested in giving some time back to someone who has given many hours over the last 30-40 years to NT motor sports. We may as well try and claim him as a part time local, Grant O'Rourke takes the win over John Zappia at the Westernationals at Perth Motorplex. Well done Grant and team after what appears to have been a tough weekend for not only the car but also the team. It's not every Friday the Chief Minister of the Northern Territory calls in for a chat to the HVDRA President so we took the chance to throw him in the seat and warm up the Maclean Motorsport Pty Ltd Top Alcohol Funny Car.